Picturesque but time-worn Ellen's Farm near Rudgwick. A typical Money card with a white on black caption and dots acting as "spacers" between words. Postcard publisher at Slinfold. Profiled by Michael Goldsmith in Picture Postcard Monthly, "The Postcards of Rural England" (2006, 331, pp. 22-24). The delightful "Rural England Series" of real photographic cards cover quite a large area of Mid Sussex, including Slinfold, Horsham, Warnham, Rudgwick, Itchingfield, Handcross, Warninglid, Slaugham, Pease Pottage and Petworth. There are even some "stray" Brighton cards and also a number of Surrey and Yorkshire cards. The publisher of the cards, Clifford Money, was born at Thaxted in Essex in 1859, the son of Frederick John Money, a surgeon. He worked in Canada and South Africa as a mining engineer, and is believed to have fought in the Boer War (1899-1902), before settling at Warwick Lodge at Slinfold. On November 21, 1901, he married Maud Mary Inman at the Parish Church of St Mary's at Guildford. Born in 1859 and aged 40, she had been keeping house for her unmarried brother, Thomas L. Inman, a dispensing chemist at 68 High Street, Guildford. She came from Brotherton in Yorkshire, and was the daughter of Thomas Parkinson Inman, who was deceased. The assistant curate who officiated at the marriage was E. J. Inman, presumably one of Maud's relatives. After their marriage, Clifford and Maud set up home at Rose Cottage (now called Holdens), an attractive Victorian house next to the King's Head pub in Slinfold. For some now long lost reason, the Moneys renamed their new home "Kei-a-Gomeena". In Slinfold Street (2000, The Slinfold Society, p. 67), Diana Chatwin notes that Clifford Money "was remembered in later years as having been an eccentric figure who cycled everywhere in his broad Boer War uniform hat". In 1903 Money started work as a postcard publisher, and quickly demonstrated his talent. One of his earliest cards shows Knepp Castle before the disastrous fire in January 1904. Almost from the outset, Money tried to ensure that his cards had a distinctive "brand image". The fronts had a broad black border or panel under the photographs, with captions written in large white lettering, often accompanied by squiggle like decorations. The first cards had very ordinary backs printed in black, but by July 1904 special backs were introduced, printed in red and prominently labelled "Rural England Photo-card", with a spray of curving lines and other embellishments. After only about a year the label was changed to "Rural England Photo Post Card" printed in black. Perhaps because of pressure of work some cards were issued with blank or plain backs.Most of the cards were "singles", but multiviews are also occasionally found. "Off for a walk - Feb. 13, 1905"
"The confirmation at Slaugham - May 27th 1905"
"Granny - 1905. Ninety three and going strong"
"The match of the season". A Slinfold wedding dated August 23, 1906"
"The Windmill Inn, Ewhurst, after the fire November 7, 1906"
"Mrs Francis takes the first prize for her garden at Rudgwick 1907"
"Funeral of James Albert Edwards at Slaugham, July 1907"
"Funeral of Col. St John, Slinfold. Feb 1 1908"
"Bishop of Chichester consecrates additional ground in Slinfold Churchyard - July 12, 1909"
"The Slinfold (Junior) Christian Endeavour Picnic, 16.7.1910"
"The Peace Pageant at Slinfold on Aug 4 1919." An undated card shows "The fatal tree" that was hit by the Vanguard bus on Handcross Hill in July 1906 with serious loss of life. Money had to compete for business with a second Slinfold postcard publisher, William Waller. It is curious that such a small and relatively isolated village should have supported two publishers, when some much larger settlements could barely muster one. Diana Chatwin makes the interesting suggestion that Money paid Waller to take the photographs for his Rural England cards. Waller was certainly adept at recording farming and rural life, and might indeed have been willing to accommodate Money. 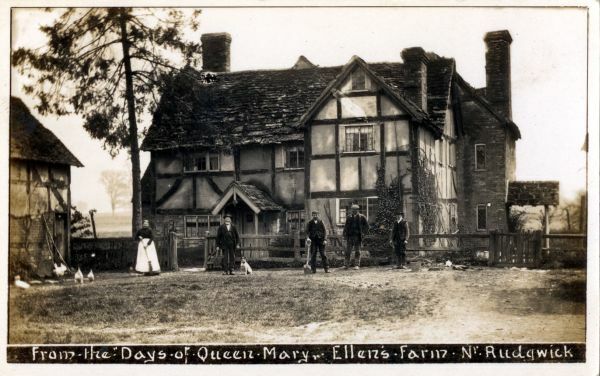 It is widely rumoured that some of the Rural England negatives were found in Waller's Horsham shop when it closed in the 1950s, but if true this might only mean that Money gave or sold the negatives to Waller when he stopped postcard publishing. The handwriting of the captions on the Money and Waller cards is very different, and, although the two publishers sometimes produced cards of the same event, for example the same steam roller accident at Slinfold, the photographs were always different. It is also worth noting that Waller's cards cover a much smaller area of Sussex than Money's. Goldsmith has discovered that Money produced cards not only of Mid Sussex but also an area around Buckden and Skipton in Yorkshire, where his wife's parents lived. She died in late 1922, aged 63, and he seems to have stopped postcard publishing at about this date. On May 12, 1924, he married again, this time at Aldrington Parish Church, near Hove. His new wife, Lilian Wallace, 24 years his junior, had worked for him as a housekeeper. In his will drawn up in the same year as his marriage Money refers to his wife as Lilian Mary Ethel Eva Beatrice Gordon Douglas-Hamilton, an interesting mouthful! On the marriage certificate her name is entered only slightly more succinctly as Lilian Mary Ethel Gordon Wallace, daughter of George Wallace. Money himself is described as a "gentleman". Lilian gave birth to a daughter, Lavender H. Money, at Brighton in late 1926. Soon after this, she and her husband moved with their infant daughter to a small cottage ("Oxen End") at Great Bardfield in Essex. On March 20, 1930, at the age of 69, he died at Saffron Walden Hospital, leaving effects of £1042, quite a tidy sum in those days. Lilian, who was granted probate, gave her address as Clydesdale, Berriedale Avenue in Hove. Whether she was just staying with friends, or had forsaken Great Bardfield to live in Hove is unclear. Lavender Money married Edwin Curtis in the Poole area of Dorset in 1948, but no further information about her has come to light.